In large skillet over medium heat, melt butter. Add apples, sugar and star anise and cook, stirring occasionally, until apples are tender, about 3 minutes. Increase to high and cook, stirring occasionally, until juices are almost evaporated, about 2 minutes; set aside. In large bowl, whisk together milk, eggs and salt. Stir in bread and set aside for 15 minutes. Meanwhile, preheat oven to 450°F. Butter 24-cup mini muffin tin. Remove star anise from apples (save for garnish). Stir apple mixture into bread mixture. Spoon mixture into prepared muffin cups. Bake until lightly browned and set, 20 to 25 minutes. 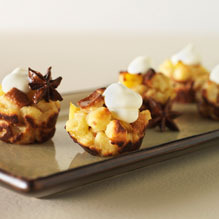 Serve warm, topped with sour cream or crème fraîche and reserved star anise.